Yeah! The kids are back to school. I was running out of ideas to keep the kids busy during the summer. They are loving school and their teachers. I am always worried if they are going to like their teachers because I remember in grade school how I hated some of my teachers. 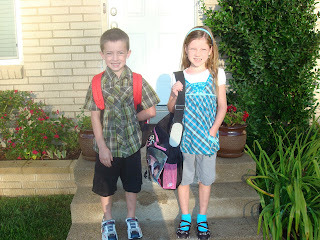 Madison is in 2nd grade and Clayten is in Kindergarten. "Finally I'm in Kindergarten," he said the first day of school. He has been going to preschool for two and a half years. His birthday is September 25th so he missed the deadline. He wishes he could go all day like his big sister so he could have more recess and eat lunch at the school. It is nice to have alone time with Rebecca for a few hours in the morning. The kids are so excited when I go and pick them up, not to see me, but to see Rebecca. Everyday the first thing they say is "Hello Rebecca I missed you, mom did she miss me?" Oh yes honey she missed you so much. It is fun to see the love they have for her and how much they miss their baby sister. This photo makes it look like Clayten is taller than Madison but she is still an inch taller than her brother. Poor girl she has her moms height. The Lynn Family reunion was at Cherry Hills. I haven't been there for nine years and boy it has changed but they did some nice improvements. The kids loved going down the slides. We went down a few times with them but couldn't keep up so we just watched them go down by themselves. The older cousins got a train going in the lazy river of about 20 people. That was cool to see! We had a scavenger hunt for the kids and a yummy lunch at Marshall and Jill's house the next day. Who by the way put this reunion together and did a swell job. We all enjoyed being together. It was an awesome reunion!